Just an hour east of Vancouver, we have a true abundance of farm fresh food at our fingertips. 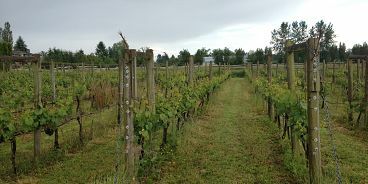 Tourism Abbotsford’s program provides a road map that directs you to a variety of specialty farm-gate vendors, open air markets, charming eateries, heritage sites, fairs, and other special events. The tours are self guided, meaning that you travel in your own car, free (unless otherwise noted and except for your purchases along the way, of course) and at your own pace. A day exploring Abbotsford makes for a wonderful fresh-air adventure with friends or family, and a unique opportunity to learn directly from the farmers about their processes, passions and ways of life that challenge you to consider adopting a 100-mile diet. What a great fall afternoon activity visiting The Applebarn Pumpkin Farm would be! Get started by downloading the brochure and map, here. Come spring 2015, long table dinners will be held at Tanglebank, where diners can enjoy open air meals alongside Circle Farm Tours farmers and growers. To get on the waiting list, email tanglebank@telus.net and use ‘Long Table Dinner’ in the subject line. Expect a follow up early in the new year to confirm your booking.